Some items in the sea float permanently. Other, heavier items, can be stirred up by large waves. All of this is carried by the waves until the waves are slowed down by washing onto the beach. The water can then no longer carry even the lightest of items and the sea drops its load. 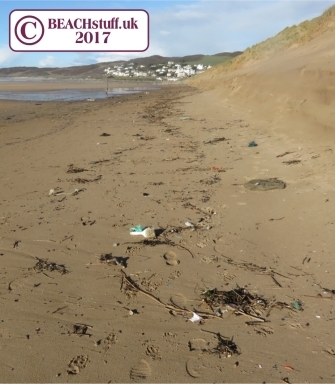 The majority will be dropped at the highest point that the water reaches up the beach - this is known as the high tide line and the line of detritus - both wildlife and rubbish - it leaves is called the strandline. how high the high tide is. When the strandline is left (ie. when it is best to go and look for finds) is dependent on when high tide is. Both of these things - the height of high tide and the time of high tide change every day. Our sea changes height during the day. These changes in sea levels are called 'tides'. The water gets shallower and then deeper which determines how high up the beach it reaches. 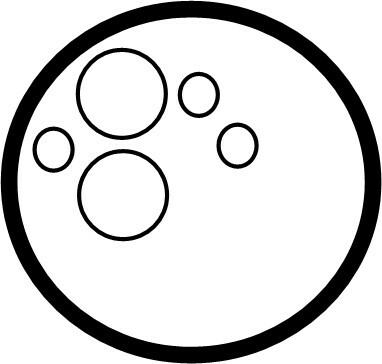 Thios means the sea is never at the same point on the beach for long. It travels in (as the sea level rises) and then travels out again as the sea level falls. The higest point up the beach it reaches, is where the strandine lies. 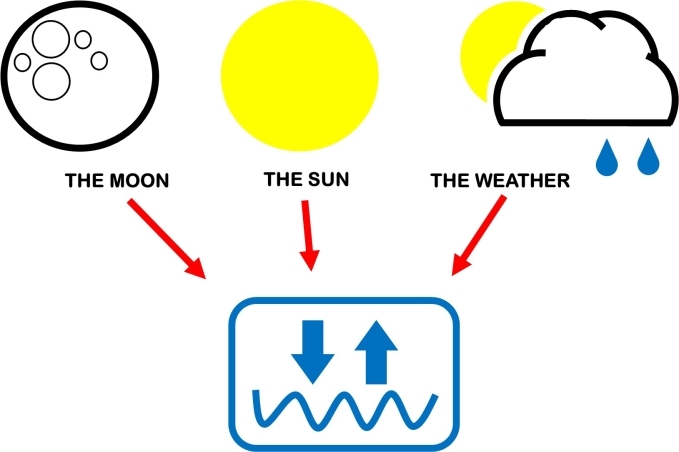 The diagram below shows the three main influences on our tides. Just like Earth, the moon has gravity. This pulls on the part of the Earth that is closest to it causes the sea to bulge towards the moon. This bulge is a rise in sea level which is our high tide. In this way, the moon is the biggest cause of our tides. 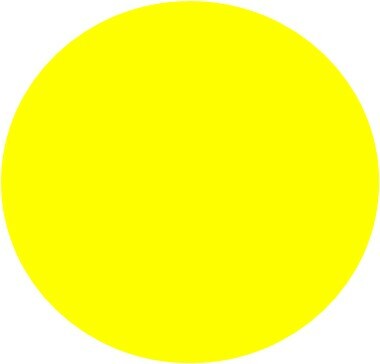 The sun also has gravity but, as it is so far away, it has a smaller effect on us than the moon does. However, at times, it exascerabates the impact of the moon causing our highest and lowest tides (including the neap and spring tides). Because of the influence of the sun, the size of tides changes throughout any given month. 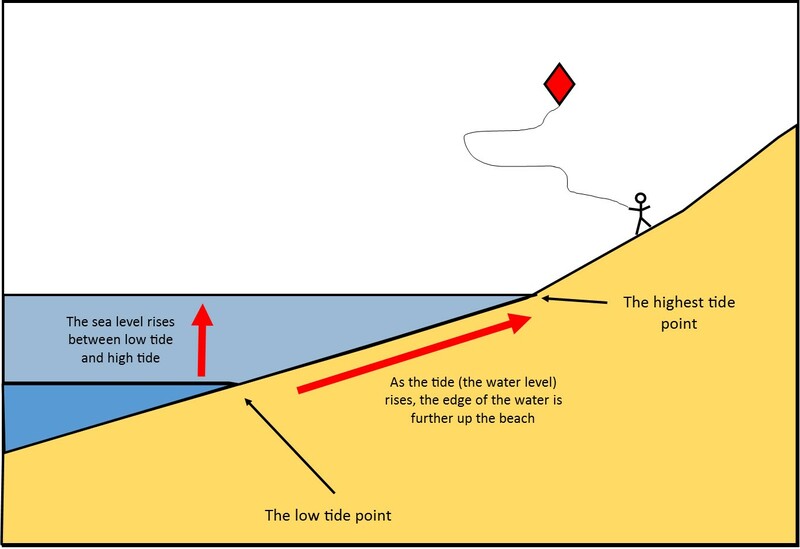 There are two key ways in which the weather affects the size of the tides. High air pressure (often bringing good weather) causes air to sink which squashes down on the sea meaning that tides are lower. Low pressure (usually times of awful weather) means air rises, taking the pressure off the sea allowing tides to be higher. Onshore winds (blowing from the sea onto the land) can sweep the water beneath them towards the land bringing the tide farther in. Offshore winds (blowing from the land onto the sea), can push the sea, meaning that the tide does not come up the beach as far. Winds also are the cause of waves (see below). 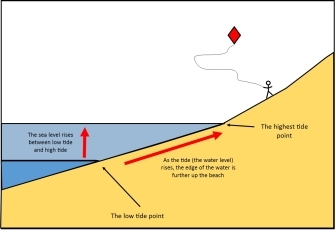 So the tides - governed by the gravity of the moon and the sun and greatly affected by the weather - determine where the strandline will be on a beach. The wind, travelling over the sea, creates waves. The bigger the waves, the heavier the items they can carry onto the beach. So huge waves can mean that large pieces of tree, for example, are carried onto the beach. It can also mean that heavier items of rubbish - glass bottles, pieces of brick, mobile phones etc. are washed up from where they had sunk onto the sea floor. 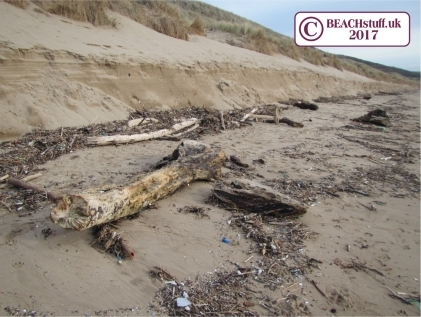 A combination of a very high tide and large onshore waves brought very heavy items right to the top of this beach. Always check the tide times before you go beachcombing - to make sure you are not going to get trapped by high tides.